The Pick tool lets you select and transform objects. The Shape tool lets you edit the shape of objects. The Knife tool lets you cut through objects. The Eraser tool lets you remove areas of your drawing. The Free Transform tools lets you transform your object by using the Free Rotation, Angle Reflection, Scale, and Skew tools. The Zoom tool lets you change the magnification level in the Drawing Window. w The Pan tool lets you move the display of the Drawing Window. The Freehand tool lets you draw lines and curves. —The Bezier tool lets you draw curves using a connect-the-dots style of drawing. The Natural Media tool provides access to the Brush, Sprayer, Calligraphic, and Pressure tools. The Dimension tool lets you draw vertical, horizontal, slanted, or angular dimension lines. The Connector tool lets you join two objects with a line. The Flow Chart tool lets you join two objects with a flow chart line. The Rectangle tool lets you draw rectangles and squares. The Ellipse tool lets you draw ellipses and circles. The Spiral tool lets you draw symmetrical and logarithmic spirals. The Graph Paper tool lets you draw a grid of lines similar to that on graph paper. The Text tool lets you type words directly on the screen as Artistic Text or as Paragraph Text. M The Interactive Fill tool lets you apply various fills using the mouse. "1_t_ The Interactive Mesh tool lets you apply a mesh grid to an object using the mouse. The Interactive Transparency tool lets you apply transparencies to objects using the mouse. Where is the toolbox in coreldraw? What are the various tools in the tool box of corel draw tool? 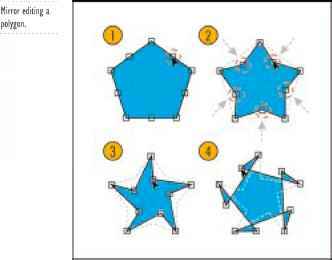 How to use knife tool to cut an object to a star in corel draw?